Tapping into the strong current of quality electronic music coming out of Sweden, the latest Bass Culture shines a light on two talents working out of the Stockholm underground who have created their own imprint on the European house and techno scene. The Pajala Sunrise EP marks the first release that Mr Tophat and Art Alfie have issued away from their shared base camps of Junk Yard Connections and Karlovak, two labels that showcase the pair’s commitment to pushing 4/4 dance music forwards wherever they can. Energy lies at the heart of the sound that Oscar and Rudolf (to give them their real names) conjure up, both in the urgent pulse of their full-bodied drum arrangements and the spiritual lilt of their melodic content. Take “Pajala Sunrise”, the A-side on this latest offering, which surges forth on an immersive kick and hat combo coloured with a deceptively funky bass lick. While this rugged exterior provides the momentum to the track, the esoteric keys and pads that come drifting in deliver the soul. With a peak populated with wayward sirens and sunkissed piano stabs, it’s a club ready workout that speaks directly to both body and mind. Where the A-side is all joyous celebration, “Ressle Restroom” heads into moodier territory where percussion dominates the frequency range. It’s a slow-burner, holding back on all the elements for as long as possible to truly draw the mind into a sparse soundscape populated by abstract vocal snippets and pumping locomotives of drums, inspired by the choppy funk of micro house but welded to a more weighty rhythmic framework. The deeper into the track you go, the more the sound world builds up around you, from crowd ambience to momentary diva croons, the track never peaking or troughing as much as constantly burrowing into your subconscious. 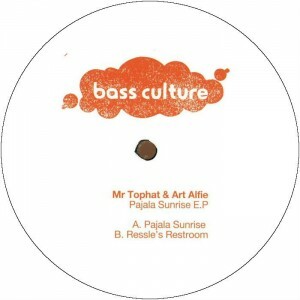 For their first adventure away from their own highly-regarded labels, Mr Tophat and Art Alfie have demonstrated the skills that have brought them so much success on their own terms. Bass Culture is only too happy to help spread that talent even further afield. Out on vinyl April 2014, out digital June 2014. Dan Curtin dark, warm, sleazy underground grooves that pound, playing and supporting for sure..badass release Boris Werner On Point like alwas with their gritty approach on house, full support! Franco Cinelli WoW Killer Stuff! !, thanks a lot : ) Brawther Entendu au DC10 cet ete… Attendu avec impatience… 5/5 Molly Great Ep !!! will play it for sure, Thank you 🙂 Federico Molinari very cool release! Anthony Collins Mr Tophat & Art Alfie are on fire these days ! Joel Alter I´m a fan of these guys, like Zlatan says: it´s not easy playing simple! Thanks! Keep it cooking, swedish quality! Sebo K excellent ! can’t wait to play it ! Danny Tenaglia all good…thanks for the promo!!!!! Franck Roger Will play Pajala in pyjama 🙂 thxxx Stacey Pullen cool thanks Dorian Paic ressle s restroom is the one for me ! cheers Dorian* Dubfire Cool Stuff , Thanks!! Julietta loving & gonna play it 🙂 Javier Carballo yes… big release!!! Willie Graff Been waiting for this EP to come out since I heard Djulz play these at DC10… Another killer release from this duo! Straight up dancefloor madness. This entry was posted on April 15, 2014 at 13:43 and is filed under Release.